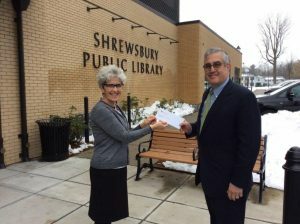 In the spirit of giving and fostering goodwill in the community during the holiday season, Southgate at Shrewsbury recently made donation to the Shrewsbury Public Library. Dana Levenson, President & CEO of Southgate at Shrewsbury visited the library to make the donation in person, much to the appreciation of Library Director, Ellen Dolan. For more information about the Shrewsbury Library Sunday Sponsorship program, you can contact the Library Director at (508) 841-8537 or email edolan@shrewsburyma.gov. Photo caption: Dana Levenson, President & CEO of Southgate at Shrewsbury and Library Director, Ellen Dolan.